The long awaited trip to Brighton for Kas to do the Brighton Half Marathon, entry to which she won as part of her Virgin London Marathon package from Lucozade Sport. We did our usual parkrun in Milton Keynes in the morning and then dashed home for a quick clean up before heading out on the highway, looking for adventure and whatever comes our way, as it were. Whuilst the prime objective of the weekend was Kas’s run, we were loaded up for a general weekend away, and were calling it a mini-break as much as anything else. All good mini-breaks have to involve some form of posh coffee and cake (or pies) so once we thought we were approximately halfway there (Cobham Services) we thought we’d better park up and do the doings. While the doings were being done, I thought I’d check the locality for caches, as you do, not really expecting anything nearby. Indeed, according to Google Satellite View, the services aren’t there. So imagine my total (lack of) surprise when a otorway Madness cache appeared a mere 200m away from where I was sitting. Got to be done. So while the girls were finishing up their lunch I ventured over what looked like fields, but was actually a car park, and made an easy find under a bench near the bus park. It’s a new county for me too. Never been caching in Surrey before. It turned out that we’d stopped a lot further on than halfway. Once we got back in the car expecting another 2 hours or so we were very surprised and quite happy to be entering Brighton a mere hour later and trying to pick our road down to our hotel in Newhaven. The hotel was easy to find but not so easy to get into. There’d been a lot of rain and the car park around the front was totally flooded. We had to park down the side of the hotel, where there weren’t really that many spaces. The hotel itself was a fairly standard Premier Inn of the variety that has an attached pub for the provision of food. The room was spacious enough and we began what we hoped would be a gentle evening. It was about 4:30pm and the light was all but gone. This is where we hit upon a bit of an issue. As Kas was unpacking she noticed that she’d failed to pack one of her key pieces of running equipment. The one that is, shall we say, more necessary for a lady than for a gentleman. So we had to make a dash up to the nearest running equipment shop, which turned out to be in central Brighton, and yes madam, we’ll be open until 5:30 pm so you should have plenty of time. Driving into new places in the dark isn’t my favourite thing in the whole world so I was glad that Kas was doing it. We managed to get parked fairly easily and find the relevant shop easily too. So far so good. It was a bit warm inside the shop for me, what with me wearing shirt, thick jumper and ski jacket, but thankfully Kas found the necessary item fairly quickly and we were out. Which left us wondering what to do about dinner. Neither of us really fancied the hotel pub so we did a quick search for the nearest Zizzi’s (always good before a race because they do pasta and pizza, and they do stuff the kids will eat, whilst maintaining a reasonably grown-up restaurant feel). Oooh ! There’s one about 300 yards that way. That’ll do us then. After which it was time to get kids and wife to sleep ready for what promised to be a long day. Sunday morning greeted us with a nice warm radiant smile. Well, it was sunny, which is about as good as you get in the middle of February. We needed to be leaving the hotel at 7.15 to avoid road closures but the pub/restaurant resolutely didn’t open for breakfast until 7. It’s the rules, don’t you know. So we dressed, packed and prepared everything first and then carried everything we needed into the pub with us, ready for a swift exit. It’s impressive how much the kids actually managed to eat in the 15 minutes we had in the breakfast room. Well done girls. And so off we went for the short drive up to our designated parking spot at Brighton Racecourse and a fairly hair-raising (if I had any) bus ride down some very steep hills to the race venue on the sea front. We were dropped off a hundred yards or so from the bag drop and general corral areas, so all going to plan so far. At this point we decided to pretty much leave Kas to her own devices while we went off for a spot of light caching to pass the time. While Kas was waiting to start we grabbed a couple of easy-ish ones on the sea front and tried to solve the fairly complicated, but rather excellent Parallax View II. We mis-counted one of the stages so walked up to a place which looked hopeful until we got there. Botty ! By this time the runners were pretty much on their marks, and had got set, and were just waiting for a “go” – there certainly were quite a lot of them. Which meant that we had to wait a while before we could get over the road to the pier. On the way there the kids decided they were hungry, so we had to wait outside a stall at the end of the pier for 10am so that they could grab an ice cream. The we entered the pier to do The Parallax View (also excellent) and about 3 others. I thought I had the calculations wrong for this one too because it seemed a long way away, but off we went. And it wasn’t there. So I recalculated and realised the problem, but by this time we were running out of time, so we looped back through the middle of Brighton back to where I now knew was the location of Parallax View II (it was an easy find) and then made our way back to the finish line to discover that not only had Kas finished, she’d run a (slight) PB. And the sun was still shining. A good morning for her and a reasonable if slightly frustrating one for us. Still, at least we got a few decent photos. We jumped back on the double decker bus and took a different but equally steep route back up the hill to the racecourse, and an end to the morning’s frivolities. If you look at a geocaching map of Brighton you can see a great big fish shape with the head being a series of traditionals around the outskirts of Saltdean and the body and tail being a series of puzzles stuck out in the sea. Obviously they’re not really in the sea, but… All these puzzles are actually the same thing, near enough. They are all Hidato puzzles, of increasing complexity as you move in numeric sequence through the series. These seem fairly easy once you apply a bit of deductive reasoning to them. So I was armed with the solutions to about 25-30 different puzzles, plus all of those trads to go for too. By my estimation I could just about get around in the afternoon before darkness descended. Kas had plans to get cleaned up at the hotel then go back into central Brighton to meet an old workmate for a spot (more) of ice cream, posh coffee and crazy golf. So I had an afternoon of beautiful sunshine, a GPS full of unfound caches, and no one to stop me. My walk started at a YOSM next to Roedean School and continued over the downs around the back of the school and towards Saltdean. I also started collecting information for a multi that sdtarted at the same place. I still don’t know why they’re called “Downs” because they seem mainly to be “Ups” every time I’ve been there. The finds were all very straightforward and I was going great guns really, although maybe a little slower than I thought I might. There was a lot of upping and downing. But the conditions underfoot were generally good. I trundelled my way through Rottingdean on the coast road and into Saltdean, and eventually right through to the far side, whereupon I looked at my watch and decided I better get my skates on. Thankfully the route back was faster than the route out and I made it back to my start point at about 5:30pm just as the sun had finally disappeared. I measured out my route when I got home and I’d walked about 11 miles. So when I add in the distance I covered in the morning with the kids I’d actually covered at least as much ground as Kas did, just a bit more slowly. We tried our very hardest to find a fairly posh restaurant in Newhaven. We really did. But we failed. Not to say that where we ended up was bad, it just was a kind of place I don’t think we’ve taken the kids before. It was down by the harbourside and looked from the outside like a typical English seaside town old pub. It was called the Hope Inn. From the inside it was decorated simply, with a lot of wood, but was set out with dining tables and looked fairly comfortable. It turned out to be really rather good for what it was. Given the general state of us I think it was actually perfect. We’d all spent most of the daylight hours outside and all of us, in some way, had covered a lot of ground and caught the sun. We didn’t really need “posh”. We needed “relaxed”. It had a simple menu that was a bit heavy on the old “fruits of the sea” theme, but with a few notable (and hence to the ladies of the house “edible”) other things. I think I ended up with a substantial pie and some chips. The kids had a roast dinner, I think, although we had to wait a few minutes so they could have fresh roast potatoes. The other thing of note there was the pub dog. “Dog” is a bit of an understatement. More of a hairy horse, if I’m being honest, but it was softer than a pack of Andrex that hasn’t been put in the freezer, and what was really remarkable is that Izzy was brave enough to go stroke it. Blimey ! And we had pudding as well, because it would have been a sin not to. Monday morning, and no hurry to get away because it was half-term week, so we planned a leisurely breakfast followed by a leisurely few hours doing some bits and bobs in Brighton. Breakfast was certainly leisurely. And once we’d finished eating it our rate of progress over the ground was somewhat more leisurely too. 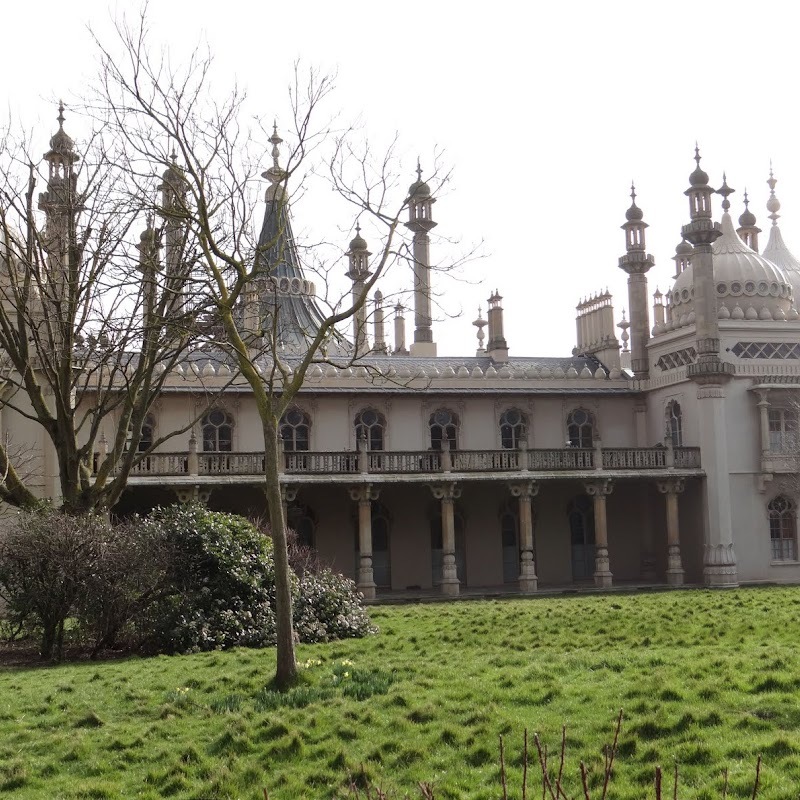 We decided to drive down into the centre of Brighton to see what took our fancy. The price of parking didn’t take our fancy very much. We stuck the car on the side of the road near the pier then baulked at the price of £7.50 for 3 hours, and moved on to a public car park further inland. It was a bad choice. The same 3 hours was going to cost us £15 in there. So we moved back again to the roadsisde near the pier. The kids were gagging for a go on the big wheel thing, so it had to be done. A for once the “picture of yourselves on the tourist attraction” stall got some business out of us. The photos were actually quite good (see below). 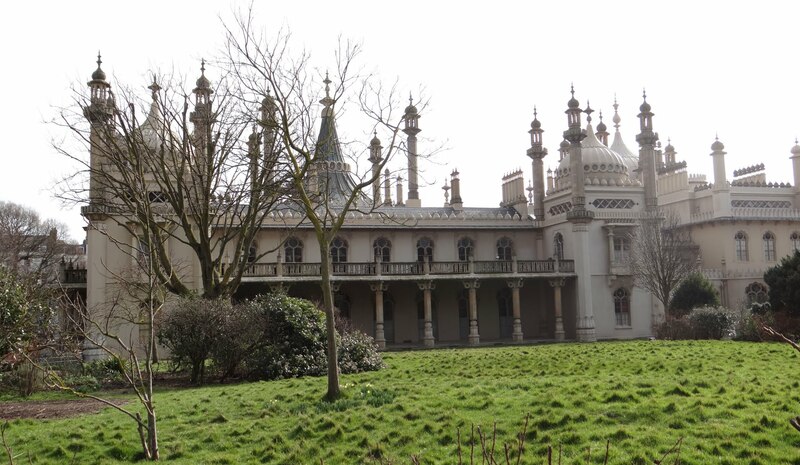 After this we crossed a couple of roads to have a bit of a gawp at the Brighton Pavilion. As with many things it seemed much smaller in real life than I imagined, but at least it wasn’t covered in scaffolding. By this stage it had turned into quite a pleasant morning too. The sun was shining and the (early) birds were tweeting away. We sat outside for a coffee in the gardens. Outside, in February. What’s the world coming to ? We still had a bit of time left on the parking when we’d had coffee so we took a walk westwards along the beach from the pier, taking in a couple of caches as we went, including the correct resting place of The Parallax View that I’d given up on the previous morning. There were a few interesting little thingummy-bob and whatsamajig sellers along the beach including one that had an impressive collection of wooden sculptures. There were also a whole host of stall holders attempting to chuck all the stones off the promenade and back onto the beach after the most recent storm. This took us nicely up to lunchtime, and lunch consisted of chips, on a plastic tray wrapped in paper, eaten with a wooden fork (or fingers) whilst sitting on a wooden bench on the pier. In February. This couldn’t have been more stereotypically English unless St George had been actually killing a dragon on the beach while we were doing it. And then we drove home. In stages. Firstly I made Kas stop at a church in Pyecombe just so that I could colour in West Sussex on my caching profile map (along with Surrey and East Sussex that made three new counties for the weekend). And then driving back towards Crawley Kas needed a stop for a posh coffee. I didn’t, so I did the old random “where’s the nearest geocache” search on my phone and discovered a TravelBug Hotel that was fully 25 yards away from where we were parked. Funnily enough, after a long weekend away like that, neither of us felt like going to the shops to buy food or cooking anything, so we didn’t. We went to the new Chiquitos in Kingston Centre instead. Good choice.